Dance instructor Rory Callahan likes to play it safe. When she meets Kyle, he’s impulsive, persistent, and her exact opposite. He’s pushing her to tango way past her comfort zone and keeping Rory on her toes more than twenty years of dance teachers ever had. Unfortunately, he’s the grandson of her family’s archrival and she doesn’t want to disappoint them. After all, her parents imagine her as a proper princess - hence her namesake Aurora, AKA Sleeping Beauty. Complicating matters, Rory’s also dealing with a surgeon boyfriend who’s perfect for her (sort of), an obnoxious boss, and desperate dance moms. Kyle wants to change her whole life, but Rory doesn’t like the stakes. After all, princesses are the ones who get the happy endings. . .aren’t they? This sweet romantic comedy is a standalone and can be read on its own. All books in the series can be read in any order so jump in at any time. Read the first book, Fooling Around With Cinderella, and see how it all began. . . The Storybook Valley books are the perfect beach reads. If you love small town romance, theme parks, fairy tale fun, and amazing love stories, then Storybook Valley will be your new favorite series. High above the crowded beach, an airplane skimmed the cloudless blue sky, its hum a distant whine over the thunderous surf. Behind it trailed a banner with red block letters. Cupping her hand over her brow, Rory Callahan squinted in the glaring sunlight. WILL YOU MARRY ME, RORY? She gasped, and her bare feet pressed into the gritty sand. Rory gripped the sides of her sunken beach chair. Her boyfriend, Dr. Brad Walker, a general surgery medical resident at Mountain View Medical Center, occupied the second chair, engrossed in a sports magazine, oblivious to the romantic gesture—or pretending he was oblivious. Rory had accompanied him to the Jersey Shore for his parents’ thirtieth anniversary party. When Brad suggested a morning at the beach before driving back to the Catskills, she never expected a marriage proposal. Her stomach clenched, the semi-queasy reaction surprising her. After all, she had wanted this—well, maybe not this, not yet—but Rory had wanted a declaration of love from the guy her mother worshipped and that her annoying big brother insisted “wasn’t that into her.” Obviously Brad was into her. This proved his willingness to make their relationship work. She would show her brother, and her friends, too. Rory knew her roommates worried that Brad didn’t carve out enough time for her, but unlike Dylan, the girls minded their own business. “The airplane. Didn’t you hire them to fly that banner?” Rory inclined her head toward the sky, even as she submerged her trembling fingers in the hot grains. When she was a kid, she and her brothers used to dig holes at the beach. They never bothered building castles as they saw Cinderella’s castle every day at their family-owned fairy-tale theme park, Storybook Valley. The boys preferred burying each other in the sand. To lure Rory into helping, her brothers insisted that if they burrowed a deep enough hollow, it would lead to China. Naively, she accepted their words every time. She wished that mythical tunnel to China would engulf her right now. Apparently, there were two Rorys sunbathing today. His Adam’s apple bobbing, Brad glanced around at their fellow beachgoers sprawled on towels, under striped umbrellas, and relaxing in chairs. He looked everywhere but at Rory. Lobster redness crept up her neck, into her cheeks. Her SPF 30 sunscreen couldn’t prevent this kind of burning. Following his lead, she joined in the happy couple search. No sign of an emotional bride-to-be on the sand, or in the water. Most everyone in the ocean continued leaping waves and bodyboarding, ignoring the life-changing banner streaming above them, and the few that pointed seemed like observers. The future newlyweds must have chosen another section of beach. Was Rory short for Gloria? Lorelai? Victoria? She highly doubted the other Rory was named after Princess Aurora from Tchaikovsky’s The Sleeping Beauty ballet. Her middle name probably wasn’t Rose, either—in some renditions of the fairy tale, the princess was called Briar Rose, or Rosamond, hence Rory’s full, embarrassing moniker of Aurora Rose Callahan. Rory was also a masculine name of Irish and Scottish origin. Who knows, perhaps a gutsy female had proposed to her boyfriend. Rummaging in her canvas bag, Rory located a water bottle. She untwisted the cap and gulped the liquid, warm from too much time in the sun. Her eyes welled behind her sunglasses. Why was she upset, anyway? It wasn’t as if she had been angling for a proposal. Rory turned twenty-five tomorrow. Most of her friends were still single. She had plenty of time to settle down. If Rory was truthful with herself, she answered yes because she didn’t want to hurt his feelings, not from a strong desire to get engaged. No, it wasn’t the lack of a proposal that disappointed her. It was Brad’s thunderstruck, almost disgusted, expression at her acceptance. As if they never had a future together. Act like you don’t care. Like you’re not humiliated. She lowered the bottle into her cup holder and adjusted her bathing suit strap. Brad had loved her ruffled black bikini top and high-rise bottoms that bared her flat abs and long legs toned from twenty-plus years of dancing. But maybe he didn’t love her. After all, he’d never told her “I love you.” When she wrote it in a Valentine’s card, curious to see his reaction, he hadn’t acknowledged it. “It’s okay, I wasn’t expecting a proposal. Not anytime soon. I want to concentrate on my career, too.” Rory studied the guy she had convinced herself was perfect for her. They met in the hospital cafeteria when she was visiting a friend whose appendix ruptured and had dated a year and a half. Not only was Brad handsome, successful, and ambitious but a future with him felt safe. At least that’s what her mother kept hinting. Once she learned Brad was a surgeon, Therese Callahan decided he was perfect for her only daughter. No expectations? Ever? In other words, Brad wanted friendship with benefits. Rory slouched lower in her chair. There might never be a right time. Did that possibility devastate her or relieve her? Rory honestly didn’t know, her nerves too frazzled for her to think clearly. Evidently she had some soul-searching ahead regarding her love life, but for now she just wanted to end this discussion. Pretend it didn’t matter. Rory didn’t want to dwell on it. “I’m going for a dip. Want to come?” She sprang up from her chair and tightened the fabric band around her auburn ponytail, still damp from an earlier swim. “Sure.” Rory escaped to the slick mirror of sand near the shore, stepping over an abandoned pair of child-sized sandals. Crashing waves dissolved into the foam, and icy whitecaps gushed over her toes. Snatches of conversation and music carried in the breeze. She inhaled the salty ocean air, trying to calm herself. Overhead, the airplane veered around and droned in the opposite direction, letters backward as if reflected in a mirror. Rory watched the plane glide through the sky, growing smaller in the distance until it dwindled to a speck. "I absolutely loved Prancing Around With Sleeping Beauty! A fun and sweet romance. I really appreciated how along with the romance, Rory was struggling to find her career path. Plus, overcoming the family obstacles and dealing with a potential Romeo and Juliet situation sure do put qualifiers on a relationship before introductions are final." "Overall, this is a short and sweet romance that I found fulfilling to read and would recommend if you are looking for a light romance with a Disney twist." "Just as good as the first book. It’s well crafted with rich details, witty dialogue, and a captivating plot." "I love the setting in a fairy tale park and how the characters are loosely based on fairy tale characters. It had a light feel to it which is the perfect diversion from those weightier feels of real life. " "Inspired by fairytale characters and following the chick-lit line you can expect the Happily Ever After ending and lots of sweet and simple moments. The writing is very good and the rhythm is steady. If you like clean romance, sweet characters, and fun reading I totally recommend it to you." 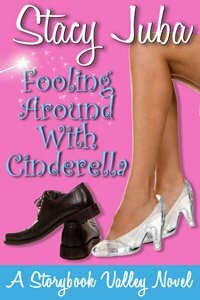 "I loved Stacy Juba's first installment of the Storybook Valley series - Fooling Around with Cinderella (read my review) - and Prancing Around with Sleeping Beauty didn't disappoint. While I call this chick lit, there are things that women of all ages can relate to going on in Rory's life." "I love author Stacy Juba’s sense of humor! I chuckled, giggled and may have even snorted through Prancing Around with Sleeping Beauty…"
"Storybook Valley is such a charming place and this series delivers the feels and romance, typical of what you'd expect from those beloved fictional favorites. I loved the characters and the setting and look forward to more books set in this delightful place." "Super cute story! I love that this series is set in a theme park - how fun! And Rory being a dance teacher - My daughter took ballet for years and this brought back some real nice memories. Every time the book talked about the kids and dance class I got pictures in my head of my daughter's class. Those are some great memories. I love when a book can do that to you." "A fun and sweet chick-lit with a twist of fairy tale. The characters are full of personality, with plenty of humor and fairy-tale puns, and a sweet romance that ends in a happily-ever-after that will satisfy readers." "A fun afternoon read that will take you back to warm summer days of cotton candy, rides, and being with the one you love." "A light, fun series that will deliver the HEA we all crave, make you believe in modern day fairy-tale romances and add to your ever climbing TBR list. I'm committed. I'll read every Storybook Valley that comes out because dang it, I CAN. I might even wear a tiara and call my husband Mr. Charming. Why not? YOLO, right." "I really enjoyed the way this story was told...This is a quick easy, enjoyable read." "If you are looking for a book to give you a quick pick-me-up with a sweet romance, humorous situations, and engaging characters this is the one you will want to read." Stacy Juba writes mysteries, chick lit and contemporary fiction that is crisp, fresh, and satisfying. She is currently developing a self-editing class for writers slated for release in 2019. To receive updates, join her mailing list for writers. You can also visit her Hockey Rivals website to learn more about her sports fiction books for teens and kids and to read blog posts of interest to hockey families. Subscribe to her YouTube Channel, Writer Tips & Book Chats With Stacy Juba. Get a sneak peek into Stacy's romantic comedy series. Includes sample chapter, interviews, princess tips, and more. You'll also be subscribed to the Staycation newsletter, filled with book news, surprise bonus content, and perks for readers.